King’s Day –The national day of the Netherlands start on the night of April 26th and continues the next day. 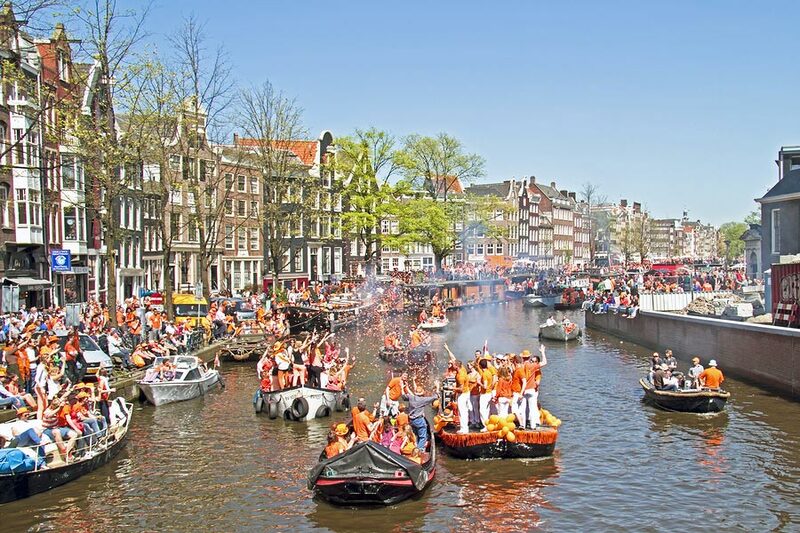 This is where we celebrate the current King’s birthday and the moment where all the Dutch dress up in orange and the Amsterdam city centre becomes filled with the country’s national colour. There are specific party areas designated for dancing etc but locals will agree that downtown is where you have to be. Wear something orange! April 26 – 27, throughout the city. Liberation Day – May 5th offers another day of partying for the orange dressed Dutchies, as it is the official day WWII ended in Holland when the Netherlands were finally liberated from the Nazis. Again, the centre of the city is packed with people, canals suffer traffic jams of small boats, and dozens of small stages offer a variety of artists to perform throughout the city. Make sure you don’t lose track of each other, as your cell phone might have trouble working in the busy heart of town. May 5, throughout the city. Ajax – Amsterdam’s football club Ajax is the country’s most successful team and with two world cups and a total of four European I victories, the club always has an agenda of exciting matches at the Amsterdam Arena stadium. Tickets are available for tourists depending on the risk and popularity of the game so for the ones who fancy seeing a game make sure you check out the club’s website. Throughout the year, Amsterdam ArenA. Amsterdam Dance Event – The world’s biggest club festival and leading electronic music platform takes place in all sorts of venues all over the city such as roof top terraces, hotels, old warehouses and pubs providing you with a unique perspective to see Amsterdam. If you’ are looking for a memorable party at an unorthodox venue then this festival is right up your street. Mid October, throughout the city. Amsterdam dance event. Gay Pride – The tolerance of Dutch culture is probably best represented during the annual Gay Pride celebrations with a tour of boats holding fabulously dressed men and women all dancing and celebrating diversity. This is where lots of tourists are surprised by the incredible friendliness and openness of fellow visitors and you’ll be bound to make new friends here. Several parties and activities are organised so allow yourself to go with the flow. The event attracts an extra 500,000 visitor to the city every year. August 13, Canal Belt District. Gay pride. High Times Cannabis Cup – Of course this city also offers a unique insight into the wonderful world of a lovely little green plant. For those visitors who want to find out more about cannabis than just visiting the numerous coffeeshops, this event will surely enlighten you. It is the pinnacle of cannabis culture. Here different types of cannabis are tested and qualified. For you as a visitor, you are going to be exposed to various cannabis related products and innovations whilst several well-known bands will perform in the city’s concert buildings. November 18-22, Leidseplein area. Cannabiscup. Uitmarkt – Holland’s so-called national opening of the cultural season hosts a weekend full of cultural activities at many different spots in town. Music, theatre, literature, movies – just about anything culture- related is featured in this free festival. It’s the perfect occasion to enjoy some awesome live music in the outdoors alongside the city’s canals. City centre, last week of August. Jordaan Festival – Those who would really like to experience the local Dutch and Amsterdam culture and get to know some traditional old Dutch music should go to the western side of the city centre, where old and young artists meet and sing what would best be described as German schlager music. If you like the combination of beer and sing-alongs and a chance to mingle with the locals, then this popular event is for you. 14-16 September. Jordaan area. Jordaan festival. Bokbierfestival – One of the cultural highlights of Dutch drinking culture, the excellent selction of special beers are the reason for you to visit this gathering of beer lovers. This is a great addition or alternative to Octoberfest for you to enjoy some speciality beers. It takes place at the beautiful former stock exchange at Damrak. This, the biggest beer festival of the country, offers you a perfect excuse to taste more than 60 types of beer. October 26-28, Beurs van Berlage. Holland Festival – Celebration of international performing arts. During the month of June each year Amsterdam hosts the biggest performing arts festival in the Netherlands. Holland Festival showcases the most talented in music, opera, theatre and dance as well as highly rated films and the best studio arts. Adding to the atmosphere, part of the festival also includes conferences and workshops. Holland festival. Comedytrain International Festival – Good for a laugh. From late June to early August each year (Wednesday-Saturday) Toomler Comedy Café hosts the very best in English language stand-up comedy. No two festival line ups will ever be the same and some of the top names in regular attendance are Dave Fulton (US), Dwight Slade (US), Andrew O’Neill (GB), Gordon Southern (GB), Phil Nichol (GB), Stephen Carlin (GB), Adam Hills (Australia), Eddie Bannon (Ireland), Adam Bloom (UK), Paul Provenza (US), and Ron Vaudry (Canada). Theater Toomler, Breitnerstraat 2. Comedytrain. Robeco Zomerconcerten – Robeco Summer Concerts. Each summer during July and August Amsterdam hosts a series of informal classical music concerts at the prestigious Amsterdam Concertgebouw. This is the perfect chance to enjoy classical music in one of the world’s most awesome philharmonic halls. Concertgebouwplein 10. Concertgebouw. Openluchttheatre – Vondelpark Open Air Theater. From the last week of June through the last week of August each summer, Vodelpark is the home base for lively open-air entertainment. You can enjoy cabaret, dramas, children’s theater, and stand-up comedy as well as music concerts and dance performances. Vondelpark, Stadhouderskade. Openluchttheater. Museumnacht – Museum Night. Each year during the first week of November Amsterdam’s museums stay open through the night and present special event programming and exhibitions for one night. More than 30 locations within the city participate in this annual event. For up-to-date information please visit n8. PAN Amsterdam – A grand art & antique Fair. Held for a week in November each year, PAN is the largest antique fair in the Netherlands. PAN showcases the many faces of art for the benefit of art lovers, curators, private collectors, art advisors, and interior designers. PAN Amsterdam is meant to inspire and each year it showcases quality and excellence delivering both enjoyment and inspiration. Amsterdam RAI-Parkhal (hall 8) Tel: +31 41 164 4440 or pan-amsterdam.nl. Arrival of Saint Nicholas – Celebrate the winter holiday season. Each year on a Sunday in the middle of November the tradition holds that Sinterklaas arrives with gifts for young children from his native Spain. In Amsterdam he arrives by boat surrounded by his friendly helpers known as Zwarte Piets and leads a parade to the city centre where he greets the children, shares sweets of the season and meets the mayor. Keukenhof – The historic flower garden. It is often said, if you haven’t seen Keukenhof, you haven’t seen the Netherlands. Keukenhof’s world-famous tulip displays are , awesome natural beauty concentrated in a small space for a short time in the spring (mid March to mid May). Located about 18 miles (30km) south of Amsterdam near Leiden, Keukenhof. it is the place to see literally millions of tulips, daffodils, narcissus, and companion bulbs in bloom. The 74-acre flower garden, probably the largest in the whole world, is themed each year to provide visitors with a trully colourful extravaganza. Stationsweg 166 2161 Lisse, Netherlands. Keukenhof. Note: This information was accurate at time of posting but often organisers change things without notice. Please be sure to confirm details directly with the venues before planning your trip. By Ömer Üçerler.